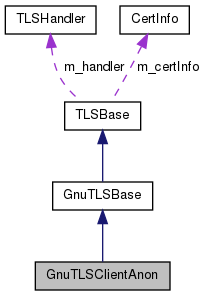 This class implements an anonymous TLS backend using GnuTLS. You should not need to use this class directly. Definition at line 44 of file tlsgnutlsclientanon.h. th The TLSHandler to handle TLS-related events. Definition at line 24 of file tlsgnutlsclientanon.cpp. Definition at line 30 of file tlsgnutlsclientanon.cpp. This function performs internal cleanup and will be called after a failed handshake attempt. Definition at line 35 of file tlsgnutlsclientanon.cpp.